Rapi was born in Mae Sot, Thailand (Thai-Burma border). When she was one month old, she had a persistent cough so her parents took her to Mae Sot Hospital for a check-up. They noticed a blue tinge when she had a cold. They were worried because she hadn’t been putting on weight and was very thin. Rapi also sweated a lot and had difficulty breathing. She didn’t have much of an appetite and she had trouble sleeping. Her symptoms were treated but her overall condition did not improve. 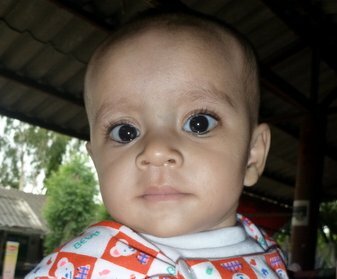 In June 2010, her parents returned to Mae Sot Hospital. It was at this time that Rapi was diagnosed with a heart problem. Her parents were informed that their young daughter would require an operation. The cost of the surgery was prohibitive and her parents were not able to afford the treatment she needed to overcome her heart problem. A friend suggested that they bring Rapi to the Mae Tao Clinic for treatment. The clinic provides free treatment to refugees and migrants from Burma. Upon arriving at the clinic, Rapi was referred to the Burma Children Medical Fund (BCMF) who would make the necessary arrangements for her to travel to Chiang Mai with her mother to undergo further diagnostic testing and eventually heart surgery. Rapi’s father moved to Thailand 32 years ago to try and find work. He has two older children to his late wife who passed away a few years ago. He has now remarried and looks after the two older children as well as his new wife and Rapi. He works as a mobile food vendor in Mae Sot. He has been making roti (sweet flat bread often drizzled with condensed milk which is rolled up and eaten as a hot snack, sometimes with banana or a fried egg) for over 22 years and his stall has become popular within the Mae Sot community. He earns around 200 Baht per day which is just enough to feed, educate and house his family. He says it is much better than living in Burma. Rapi’s parents say that they just want to see their young daughter get healthy. Her father says that he would do anything to see that she grows up in the best of health so that she can achieve anything she wants to in the future. UPDATE (AUG. 2011): Rapi came onto the BCMF program in June 2010. She has been back and forth to Chiang Mai a number of times accompanied by her mother. She has yet to have surgery but her condition is being closely monitored and she is on medication to lessen her symptoms. She is due to return to Chiang Mai in October 2011 and will have surgery later this year.